- CWF United States Tag-Team Title Tournament (March 31, '79) = Killer Khan & Pak Song defeated Karl Kox & Don Serrano, Ray Candy & Bubba Douglas, and Wayne Ferris & Larry Latham to win the tournament. - Georgia Omni Thanksgiving Tag Team Tournament '79 (November 22) = Killer Khan & Ox Baker fell in the first round to Tony Atlas & Ray Candy. Austin Idol & the Masked Superstar won the tournament. - Mid-South Superdome Extravaganza (August 2, '80) = Killer Khan was beaten by Ray Candy. - Georgia National Tag Team Title Tournament (November 27, '80) = Killer Khan & Afa lost in the first round to Robert Fuller & Stan Frasier. The Fabulous Freebirds won the tournament. - NJPW Sumo Hall (June 24, '81) = Khan lost, via DQ, to Tiger Toguchi. - NJPW 2nd Annual MSG Tag League (November/December '81) = Killer Khan & Tiger Toguchi competed in the league, which was won by Rene Goulet & Andre the Giant. - NJPW Sumo Hall (December 8, '81) = Killer Khan was pinned by Andre the Giant. - NJPW 5th Annual MSG League (March/April '82) = Killer Khan lost in the finals of the league to Andre the Giant. - NJPW 3rd Annual MSG Tag League (November/December '82) = Killer Khan & Tiger Toguchi lost in the finals to Hulk Hogan & Antonio Inoki. - NJPW IWGP League '83 (May/June) = Killer Khan competed in the league, which was won by Hulk Hogan. - NJPW Sumo Hall (June 2, '83) = Killer Khan fell to Andre the Giant. - NJPW Sumo Hall (November 3, '83) = Killer Khan fought to a Double Countout with the WWF International Heavyweight Champion, Tatsumi Fujinami. - NJPW 4th Annual MSG Tag League (November/December '83) = Killer Khan & Tiger Toguchi competed in the league, which was won by Hulk Hogan & Antonio Inoki. - WCCW Independence Day Star Wars '84 (July 4) = Killer Khan defeated Mike Reed. - WCCW Labor Day Star Wars '84 (September 3) = Killer Khan won a "No Disqualification Spike" Match over Terry Gordy. - WCCW 1st Cotton Bowl Extravaganza (October 27, '84) = Killer Khan took down Jules Strongbow. - WCCW Thanksgiving Star Wars '84 (November 22) = Killer Khan lost a "Texas Death" Match to Terry Gordy. Kerry von Erich was the special referee. - AJPW Sumo Hall (March 9, '85) = Killer Khan & Masanobu Kurisu were beaten by Harley Race & Klaus Wallace. - AJPW Sumo Hall (August 31, '85) = Killer Khan won, via DQ, over Ashura Hara. 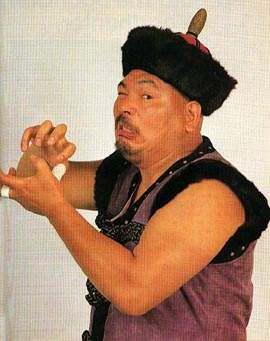 - AJPW 13th Anniversary Show (October 21, '85) = Killer Khan won, via DQ, over the Great Kabuki. - AJPW Budokan Hall (March 13, '86) = Killer Khan pinned Mighty Inoue. - AJPW United National Title League (March/April '86) = Killer Khan competed in the tournament, which was won by Genichiro Tenryu. 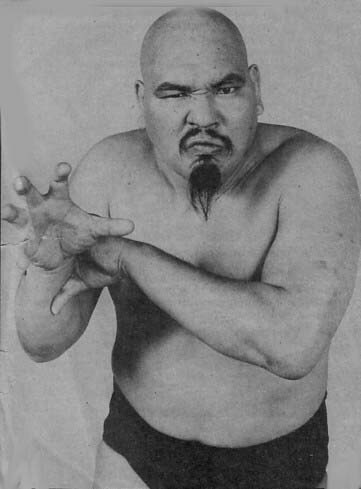 - AJPW Budokan Hall (July 31, '86) = Killer Khan lost a "Death" Match to Riki Choshu. - AJPW Real World Tag League '86 (November/December) = Killer Khan & Terry Gordy competed in the league, which was won by Genichiro Tenryu & Jumbo Tsuruta. - AJPW Budokan Hall (December 12, '86) = Killer Khan & Terry Gordy defeated Samson Fuyuki & Takashi Ishikawa. - WWF Legend's Battle Royal (November 16, '87) = Killer Khan lost, via DQ, to Jake Roberts.